Net metering for stored solar power could open up new market interest in battery-paired systems. Net metering compensates solar customers for the power they contribute to the grid — but if they route the electrons through a battery, they’re out of luck. Utilities understandably don’t want to pay net-metering rates for batteries charged by grid power. So far, that means solar generation stored in batteries for later use doesn’t earn net metering dollars either. That could change, once the California Public Utilities Commission responds to a petition that, unusually, drew support from both the solar industry and utilities. 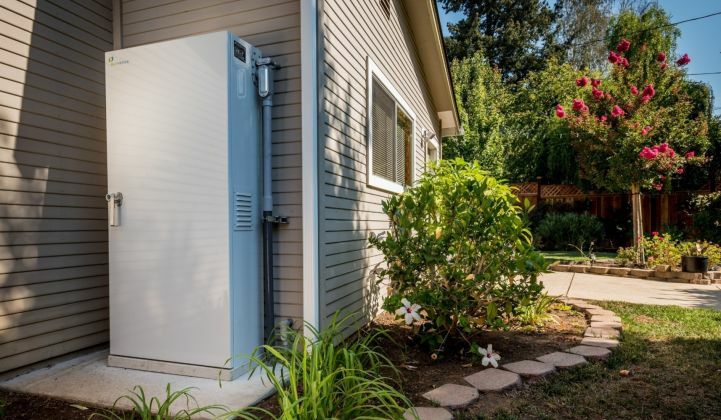 "If I’m not charging from your electricity, if I’m charging only from a solar source, the battery is basically an accessory to the solar system," said Joshua Weiner, who worked on the concept as president of design engineering firm SepiSolar, which specializes in solar plus storage. "All the policies in place support this. [...] Somebody just needs to say that this is allowed." If certifiably solar-powered batteries can get paid, that could unleash a market signal with sweeping ramifications for solar customers and utilities trying to balance a highly renewable grid. California’s shift to new time-of-use rates lowers the value of solar at midday, when it floods the wires, and increases the price of evening power. That means reduced payback for traditional solar customers who can only export when the sun shines and then have to buy power at night. Those who pair solar panels with batteries, though, could store midday generation and sell it to the grid at the peak time-of-use rates, if allowed. That personal profit addresses a systemic challenge: the dreaded "duck curve." Solar customers would make more money by exporting just when utilities are scrambling to fulfill the steep ramps required in the evening, when solar generation drops off and electrical demand spikes. "We’ve become very good at supplying solar power in the daytime; now we need to start supplying solar power in the evening," said Brad Heavner, policy director at the California Solar & Storage Association. Play that out on a statewide scale, and it’s not hard to envision the collective behavior of thousands of solar customers delivering peak power that otherwise would come from gas plants. It simultaneously reduces the technical headaches associated with a surplus of midday solar on the wires. Advocates for battery net energy metering (NEM) asked the CPUC to consider it in September, through a “petition for modification of decision.” Regulators could announce their ruling within the next couple of months. Support from utilities would be crucial to the smooth approval of the proposal. If they had credible arguments that doing this would harm the electric grid, it could dissuade regulators. But, unlike in previous NEM debates, the solar industry and the major California utilities appear to be on the same page. When the California Solar Energy Industries Association (since renamed the California Solar & Storage Association, or CALSSA) filed its petition last September, the three investor-owned utilities responded with a statement of support. “The Joint Utilities agree with CalSEIA that the time is now ripe for the Commission to provide further guidance on criteria that both maintain NEM integrity and permit certain DC-coupled PV plus storage systems to participate in the NEM program,” their lawyers wrote. The utilities want to make sure customers don’t earn NEM dollars for selling grid power back to the grid; that would violate the whole purpose of NEM, which rewards solar generation specifically. Utility feedback in the filing dealt with how to achieve this while minimizing possibilities for gaming the system. The local energy storage industry group was on board with that sentiment as well. "We take the issue of NEM integrity very seriously, and we think the outcome effectively does that," said Alex Morris, director of policy and regulatory affairs at the California Energy Storage Alliance. One way is to ensure the battery cannot export at all, meaning any exports come directly from a solar system. That limits the potential to export at more valuable evening hours, though. The other option is to modify the firmware in a DC-coupled inverter to render the system incapable of charging from grid power. This would be verified by a third party such as UL to ensure the firmware is set appropriately. NEXTracker has already completed this testing with its DC-coupled storage-plus-solar tracker product, NX Flow, offering a proof of concept that it can be done. “The Joint Utilities agree that the firmware solution as described by CalSEIA would provide sufficient assurance that NEM integrity will continue to be maintained,” the filing states. If a customer figured out how to tamper with the setup, there would be penalties. "It's an honor code with a legal stick behind it and a UL logo," Weiner said. "If you're in violation of UL or safety codes, you forfeit your interconnection." Denying a battery the ability to charge from the grid limits its capabilities. Imagine a snowstorm approaches in the middle of the night, and a battery that could provide backup power is empty from discharging all evening. The grid charge limitation would prevent it from loading up on power before a potential outage. "It’s not enabling every potential configuration, but it’s saying, 'Here are some configurations that would prove you’re not exporting brown power for NEM credits,'" said CALSSA's Heavner. The cost of third-party verification would have to be factored into the investment decision as well. For some users, though, the arrangement’s benefits could easily outweigh its costs. The assurance of pure solar charging creates solid ground for claiming the federal Investment Tax Credit on the full solar-plus-storage system. Couple that with peak-period NEM revenue, and the situation gets more enticing. That could be particularly helpful for California’s solar industry, which saw a contraction in residential deployments in 2017. GTM Research expects a contraction in the state’s commercial segment starting in 2018, as the major utilities complete the switch to time-of-use rates. Commercial customers already have an economic driver to add storage: electrical demand charges, which can make up a hefty share of monthly bills. California pioneered the commercial storage industry based on demand-charge management coupled with utility contracts. Leading commercial storage providers like Stem and AMS achieve this with standalone batteries, so the net metering policy could attract a different set of developers. At the macro level, it posits a new approach to system peak demand reduction. California, Arizona, New York and Massachusetts have targeted peak power as an area where clean energy should play a larger role. Doing so could save ratepayers from investing in expensive but little-utilized peaker plants and reduce greenhouse gas emissions from electricity. One way to do that is a clean peak standard that mandates a percentage of peak hours in the year come from clean sources. Arizona is looking at a regulatory proposal based on that concept, and Massachusetts has a legislative proposal in the works. NEM for batteries could assist that goal with a relatively minor tweak to existing policy.